Example- One of the categories I'm getting notifications for is 'illustrating'. Almost always there is no info about what it's for, what general style of art etc. Much too vague to do anything but send a request for info, and if I do that I get charged just to find out. I am a new user, am I missing something? @scottb I can see where you're coming from with this and we'll be sure to pass along your feedback for your category. On top of the desired art style, what other sorts of information do you think would be important to have? What art styles do you think we should have listed? I'd like at least a short description of the project, what it's for (eg book cover, menu, whatever) and some general style info. The heading of 'illustration' covers a lot of ground, from comic book type art to technical drawings and so on. What i see now is just something like '5-10 illustrations, ink watercolor whatever' I've been a pro illustrator for 30 years. I'm a photographer on Thumbtack, but I also own a printing/digital marketing business as well. 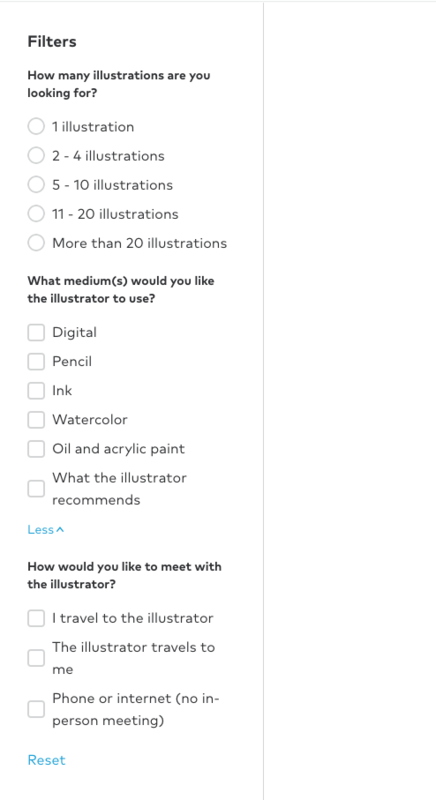 I'm kind of curious as to what the criteria currently is for requesting work from illustrators. Or, maybe @Kameron can fill me in. Kind of a question out of professional curiosity (with maybe a hint of possibly opening another thumbtack business within the category). I can see how this is super frustrating, @scottb. They might need to add some sub-category selection to increase quoting accuracy when being promoted. @CLGPatrick can you expand more on what you're referring to when asking what the criteria currently is for requesting work from illustrators? Are you wondering what filters the customers can set when searching for a pro? What filters can they choose and what subcategories of illustration can a TT pro set prices for. Example: In Photography, I can select: Portrait, Headshot, Wedding & Event, Boudoir, etc. In each of those categories, I can select metrics to automatically adjust pricing for promotion quoting. Does that clarify my question? @CLGPatrick of course, happy to give clarification! I'll attach a screenshot of the filters a customer can set when searching for an illustrator. How many illustrations can you provide? Which mediums can you use for illustrations? Do you do illustrations for commercial and/or personal use? With illustration, there are more variables when it comes to pricing and it's tough just to give a price upfront without knowing any extra details. Because of that, there isn't the option to set prices for illustration services. Don't worry though, we're working hard to get this figured out! If you do decide to add this service, I'd recommend giving a rough outline of what you charge in your profile. That way, customers can know what to expect before they decide to reach out to you. @Meckell, thanks for the clarification! This is really interesting. Is there a max number of questions that TT can ask? I guess I'm asking in the sense that TT may not want to ask too many questions in fears that the customer may not finish the process of completing the work request. "Is the illustration intended to be printed or used digitally?" I ask this a lot since this deals with how the image(s) will look based on the materials they're printed on as well as considerations of margins. "Will this be used for commercial use or for personal reasons?" This is taken into consideration for copyright laws. Most illustrators provide services to have illustrations copyrighted and then transfer the ownership of the copyright to the clients. Of course, this is for an additional fee. This is just my 2 cents. @scottb, do you agree with this or think you'd like to expand on this anymore? Yes, those would be good additional questions, but you need a description of the project first of all. I'm using illustrating as an example, but I'm also getting notifications for a few others, all of them are too vague to have any idea whether to even respond, knowing I'll get charged. Someone who just does watercolor landscapes, and someone who does complex technical art on a computer, or someone who does charicatures in ink, all fit in the illustrator category.